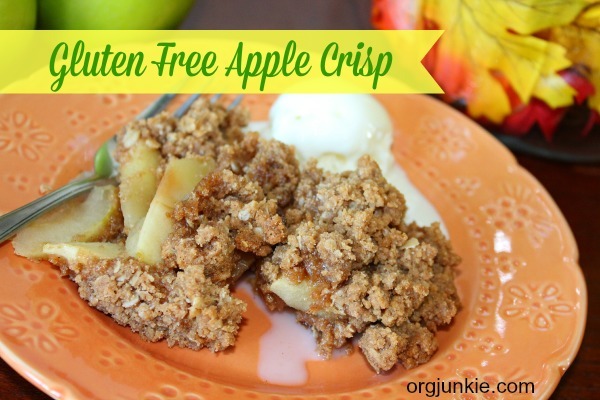 I promised this recipe for gluten free apple crisp awhile ago and have just now gotten around to making it again and taking some pictures for you. I honestly could never be a food blogger, you wouldn’t believe how many pictures I took just to get these couple of half-way decent ones. Anyway I am just so happy to have finally found a gluten free apple crisp recipe that I love. I’ve made many different recipes and was just sort of lukewarm about all of them. Then I found this one and it is so delicious. 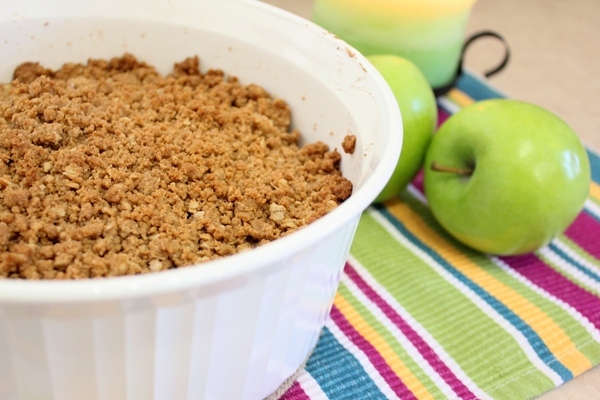 Gosh I love apple crisp, especially in the fall….and the winter and the spring and the summer. Ha! Yep pretty much anytime is apple crisp time! This recipe was inspired by one I found on one of my favorite food blogs, Your Homebased Mom and then I adapted it to be gluten free using gluten free ingredients. Some notes on the ingredients I used are below. None of these products are sponsored in any way. For the gluten-free flour blend I used one called Montana Gluten Free. It is excellent but you could use any gluten free all-purpose flour blend you have on hand. I also sometimes make up my own gluten free flour blend and it works too. For the oats I used a product called Only Oats that is wheat free and not cross contaminated in the field. 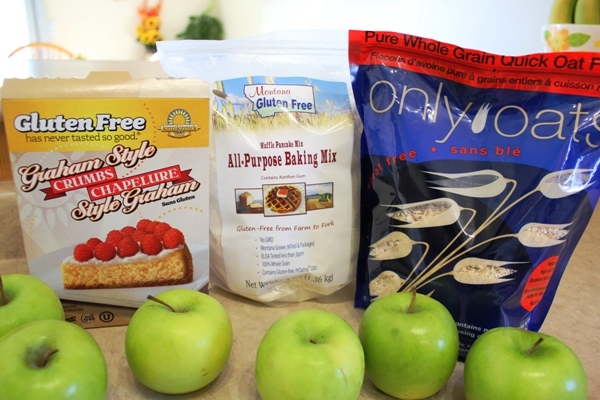 The gluten free graham crumbs I used are from a company called Kinnikinnick Foods. I have also seen in stores gluten free graham crackers that you could easily crush up with your food processor to use in this recipe. I used regular butter in my recipe however if you want to make a dairy free version you could substitute with a dairy free margarine. And that’s it. Simple and delicious!! And you see that plate up there at the top of this post? You better believe it was polished clean as soon as these pictures were taken. In no time flat as a matter of fact 🙂 Yum!! See my other allergy friendly recipes HERE. Ahh what a sweetie! Apple crisp is so yummy!